Since the 1950s or 1960s, most homes built have the interior walls covered with drywall, more correctly known as gypsum board. This relatively inexpensive engineered material was developed as a replacement to plaster and lath walls. It provides a smooth, paintable wall for a fraction of the effort of plaster and lath and once properly finished, textured and painted it really can’t be distinguished from plaster. 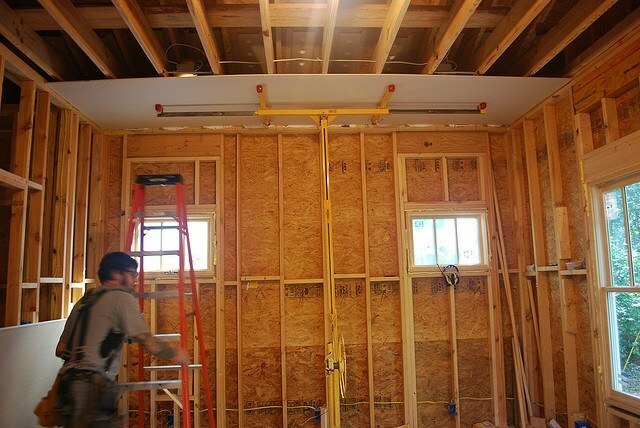 The major impetus for developing drywall was saving cost by reducing the skilled labor needed to finish walls. While taping and finishing drywall still requires a fair degree of skill, it is much less time consuming that nailing up lath strips, applying the cement inter-coating and then floating the plaster on top of that. In the beginning, drywall was slow to gain popularity, seen as a cheapening of the workmanship that was going into the home, but it eventually took hold. 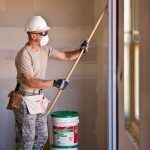 Today, it is pretty much the standard means of covering interior walls, although it is not the only way that interior walls of homes and offices can be covered. Plywood offers some distinct advantages of drywall and is a good alternative to be considered, especially if one is looking for a warm, natural look. The sterility of drywall doesn’t provide much warmth, whereas wood grain naturally does. So, what are these examples? •	Lower weight – Plywood is actually lower weight than a comparable sheet of drywall. A 5/8″ sheet of drywall weighs 2.75 pounds per square feet, while a 5/8″ sheet of plywood weighs from 1.8 to 2.1 pounds, depending on the type of plywood. •	Easier installation – Plywood can be used naturally, without the need for taping and finishing. The only finish most people apply is a couple of coats of varnish. If hardwood plywood is used, the grain patterns provide a distinctive and attractive finish, without any fancy painting techniques. Plywood can be attached to the wall with a number of different fasteners, depending on the “look” one is trying to create. •	Resisting damage – Plywood is considerably stronger than drywall. You can easily break a drywall wall, either from simple horseplay or from hitting it with a piece of furniture while moving in. Granted, damage to drywall is easier to repair than damage to plywood, but it’s better to not have the damage to worry about. This is especially good for laundry rooms, garages and other “utilitarian” spaces within the home. 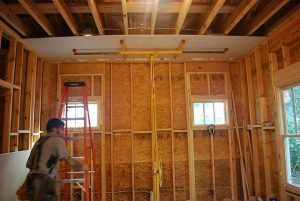 •	Structural strength – If you’ve ever tried hanging a heavy picture or mirror on the wall, you understand how structurally weak drywall is. You really can’t count on the drywall to carry the weight, but must instead find a stud to nail the hanger into. With plywood, you can attach pictures, mirrors or even shelves anywhere, without a risk of the wall breaking or the attachment falling off. There are two disadvantages to plywood over drywall. The first is cost. Plywood is considerably more expensive than drywall, especially if you are using a cabinet grade hardwood plywood. This is a large part of what has kept plywood from being used more consistently as an interior wall treatment. The other disadvantage is that plywood may not meet the fire-resistance requirements of local building codes. If the building code requires that an interior wall have a one hour fire resistance, as is common between garages and living areas or between adjacent living areas, plywood is not able to provide that. However, a wall built with 5/8″ drywall on both sides does meet that building code requirement. So, if you wanted to use plywood for aesthetic reasons, you would need to mount the plywood over a layer of drywall.